Boeing is developing innovative solutions and technologies to meet environmental requirements for its customers and the industry. Technology demonstration projects led by Boeing, such as the Phantom Eye, Subsonic Ultra Green Aircraft Research (SUGAR), and Blended Wing Body (BWB), are showing promise of substantially cleaner, quieter and more efficient flight. Boeing’s high-altitude long-endurance unmanned aircraft, Phantom Eye, is designed to stay airborne longer than any other aircraft of its kind in production. Capable of maintaining altitude for several days, the propeller-driven, lightweight aircraft is fueled by liquid hydrogen, producing only water as a byproduct. 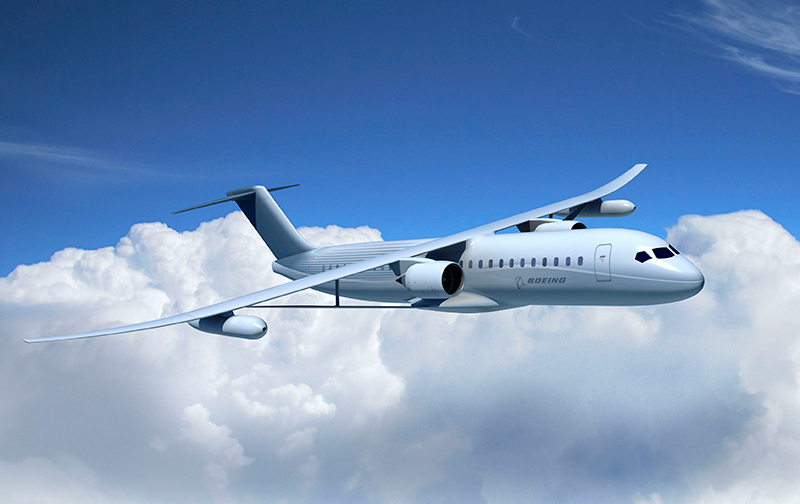 The six test flights conducted since 2012 have proved the capacities of the demonstrator aircraft, including the exceptional fuel economy of the unique liquid-hydrogen propulsion system. In January 2014, Phantom Eye received experimental status from the U.S. Air Force 412th Operations Group, allowing for expanded testing opportunities to bring this capability to market quickly. fueled aircraft soar to its Experimental Aircraft Status by the U.S. Air Force. 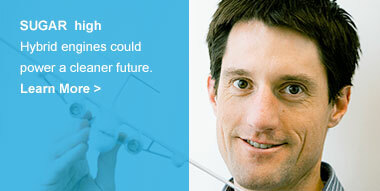 Boeing has a vision of continuous improvements in reducing fuel consumption, emissions and operating costs. Large span, high-aspect-ratio wing technologies show promise in enabling these improvements. SUGAR is a NASA contract awarded to Boeing for research into subsonic commercial aircraft technology to meet the agency’s future environmental and efficiency goals in the 2030 to 2050 time frame. Through a partnership with General Electric, Georgia Tech’s Aerospace Systems Design Laboratory, Virginia Tech and NextGen Aeronautics, Boeing currently is studying two concepts: the SUGAR Volt, run by hybrid electric propulsion, and the SUGAR Freeze, powered by liquefied natural gas. The study has shown that the hybrid electric engine technology on the SUGAR Volt could potentially improve fuel efficiency and noise, as well as greenhouse gas emissions. The hybrid electric engines would allow for the typical short-range flights to use mostly electric power while keeping a supply of jet fuel on board for longer-range flights. Similarly, the SUGAR Freeze study shows that liquefied natural gas offers improved fuel efficiency, reduced emissions and potential fuel cost benefits compared to traditional aviation fuels. Another unique feature of the Freeze is the aft fuselage–mounted electric motor. Placing the fan behind the fuselage reduces drag from the motor, thereby improving fuel efficiency. The SUGAR program has also identified potential fuel savings for the truss-based wing, which could produce a 5 percent to 10 percent improvement in fuel consumption over the conventional cantilevered wing configurations of today. After launching in 2010, Boeing's SUGAR study for NASA is expected to complete Phase 2 in mid-2014. Boeing and NASA have been studying new airplane concepts that incorporate BWB designs. The BWB concept effectively merges the vehicle’s wing and body, offering aerodynamic efficiencies over conventional tube-and-wing airplanes. The blended body helps to generate additional lift with less drag compared to a circular fuselage. A prototype BWB airplane — the X-48, configured first in a three-engine variant (X-48B) and then in a two-engine variant (X-48C) — was flown more than 100 times during a successful flight-test program, which concluded in 2013. Designed by Boeing, built by Cranfield Aerospace Ltd. and flown in partnership with NASA and the U.S. Air Force Research Laboratory, the X-48 is a scale model of a heavy-lift, subsonic vehicle. Boeing believes the concept could be developed in the future for military applications such as aerial refueling and cargo missions. The X-48C is now on display at the Air Force Flight Test Museum at Edwards Air Force Base in California, serving its new mission of educating and inspiring the next generation of aerospace engineers.